Enjoy some Roman-themed Half Term Activities at the Guildhall Art Gallery. Follow a free Roman Family Trail, or pick up an Art Detective Kit to become a Guildhall Gallery explorer. Drop in on Wednesday 25 October to meet an archaeologist, handle real Roman artefacts and make a mosaic greeting card. Free. 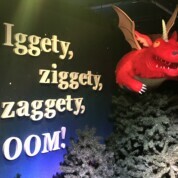 Check out Discover Children’s Story Centre‘s new exhibition A World Inside a Book: Gruffalos, Dragons & Other Creatures inspired by the works of storytelling luminaries Julia Donaldson and Axel Scheffler. We got to have a sneaky peek and it’s a-ma-zing! Admission to Discover costs £6.50 per person, plus £1.50 for this exhibition (under 2’s free). Meet Paddington at the Museum of London on Tuesday 24 and Thursday 26 October 2017 at 11am. The little marmalade-loving bear will be out and about around the Museum – see if you can find him for a cuddle! There are other Paddington-related events throughout the week too. Free. 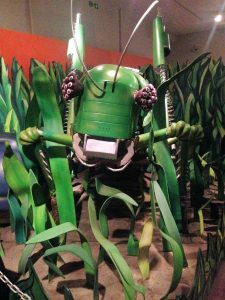 It’s the last week to catch Robot Zoo at the Horniman Museum and Gardens. They’ve also got storytelling by Dotted Line Theatre on 23 and 24 October (child £5, adult £1) and their annual Halloween Fair on 28 and 29 October. The National Maritime Museum is hosting its annual family Halloween party from 11am to 4pm on Friday 27 October 2017. Tickets cost £8 and include storytelling, arts and crafts, a musical story parade, trick or treating and, a costume competition. Laika at the Unicorn Theatre tells the story of the first space dog and the courage to change things for a better future. For ages 6 to 12. Adult £10-18, child £10-12. 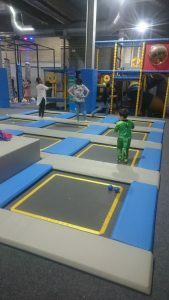 Burn off energy on the wettest of days at Oxygen Freejumping trampoline parks in Acton or Croydon. There’ll be a Halloween theme at all their sessions this week. Take little ones to the Under 5’s sessions to avoid the half term crowds. Why not visit your local city farm this week? Kentish Town City Farm‘s half term activities include pony rides and pumpkin carving, culminating with their brilliant annual Apple Day fair on 29 October 2017. At the London Wetland Centre half term activities include wildlife Guess Who?, pond dipping, and building bug hotels.